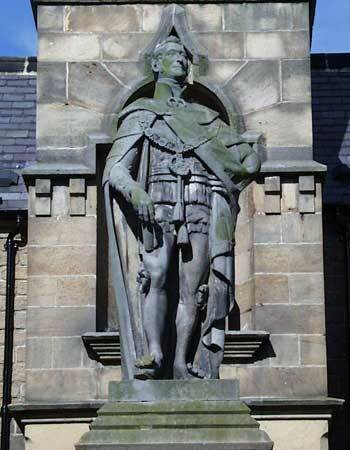 The statue of Duke of Northumberland, Master Mariners' Homes, Tynemouth. Location: Forecourt of Master Mariners' Homes, Tynemouth. Materials: Sandstone. Status: Listed Grade II. The sandstone figure of the robed Duke standing on a tapered square pedestal, the word "Northumberland" inscribed above a secondary plaque commemorating the centenary of the Tyne Mariners' Benevolent Institution, unveiled on 11 September 1937. The monument was begun by Tate who unfortunately died before its completion and the work was finished by Davies.